A picture about Loss. Dido and Aeneas, the tragic love story of the Trojan hero and the Queen of Carthage is told by Virgil. Aeneas, after the sacking of Troy, was given the task by the Gods of founding a new civilisation in Italy, but on the way he met and fell in love with the Carthaginian Queen Dido. He dallied with her until he was reminded by the Gods (and his disgruntled crew) of his mission. He reluctantly sailed away leaving the broken hearted Queen on the beach. 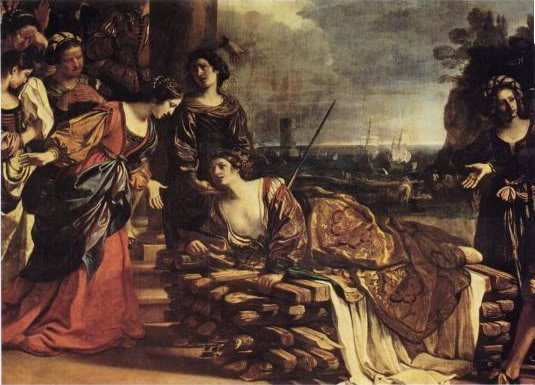 She surrounded herself with Aeneas’ gifts and possessions left behind in his haste, placed them on a pyre, then killed herself with his sword. Turner painted Dido founding Carthage using a golden palette which has influenced me in this image, she was also painted by Guercino in a very theatrical setting, Rubens and others. However, I was more inspired by music: Purcell’s “Dido and Aeneas” and Dido’s mournful lament “When I am laid in earth”. Berlioz also composed a magnificent tragic opera “Les Troyens”, his very own labour of love that nearly bankrupted him through its ambitiousness, it was chopped about and mutilated; he never saw it performed in its entirety. Purcell who died young at 35, never saw his Dido performed profesionally in a theatre either. Apparently he caught a chill when his wife refused to open the door after a night on the tiles. A tragic loss to English music. My model Lucia, from Rome, I met when she came into my gallery just for a look around while killing time before meeting her husband at the train station. She was intrigued by the exotic possibilities of the story, an African Queen, surrounded by her departed lover’s possessions, the silks and jewels, the purple and gold – she felt all this was in keeping with her Mediterranean personality and looks. She was touched too by the pathos of the story, and the loveliness of the music which she had never heard before. In common with most of the models, Lucia brought several objects with her to the set, the candles, the bronze bowl, incense burners. The photograph was shot on a Mediterranean beach near Argentario on a cloudless evening. Lucia holds my late Father’s naval sword, the ship on the horizon is the aircraft carrier HMS Eagle, my Father’s address on my birth certificate.